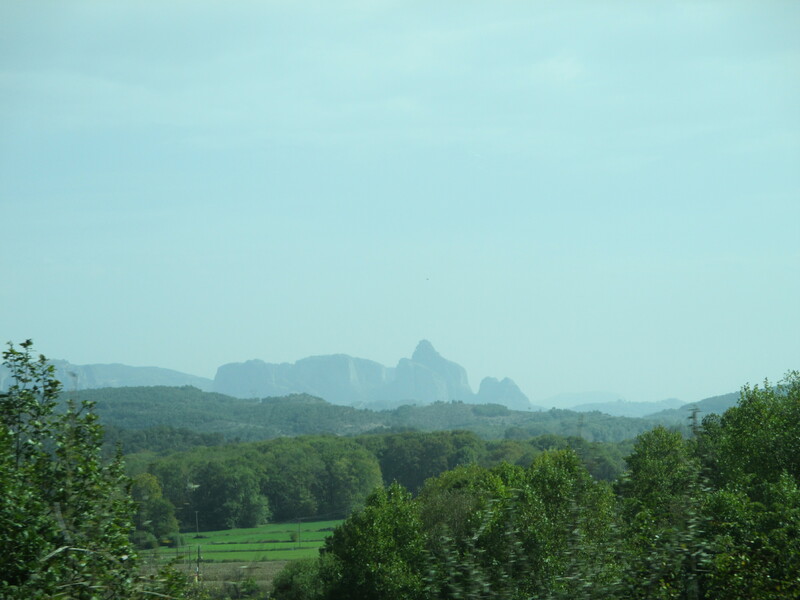 Our first stop in Greece was the Meteora region. 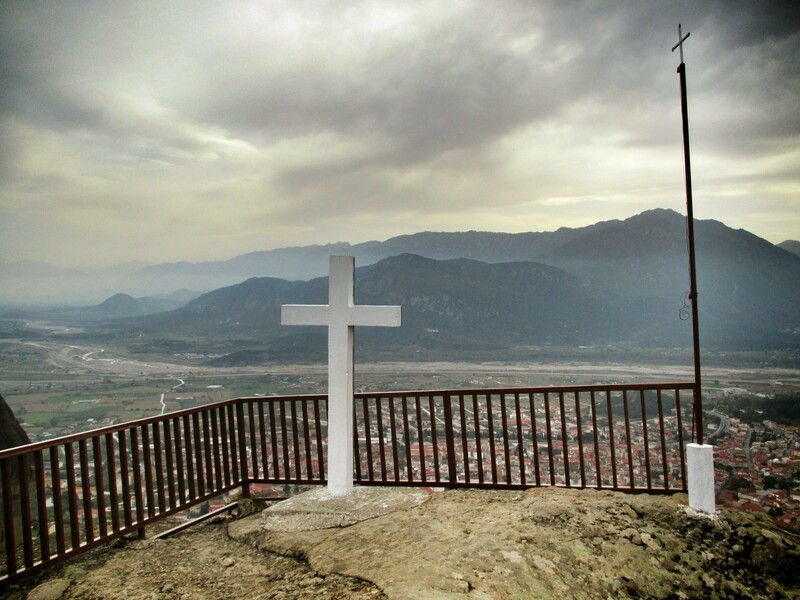 This area’s claim to fame is a large number of Orthodox monasteries that have been built on top of rock pillars. We were excited to spend a couple of days exploring the different monasteries and the natural surroundings. 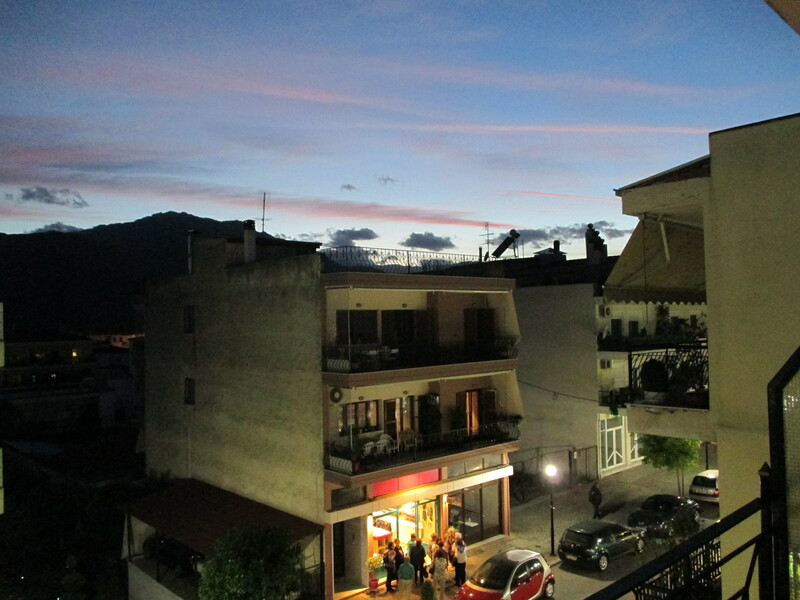 Our hostel host in Saranda helped us catch a bus from Albania into Greece. 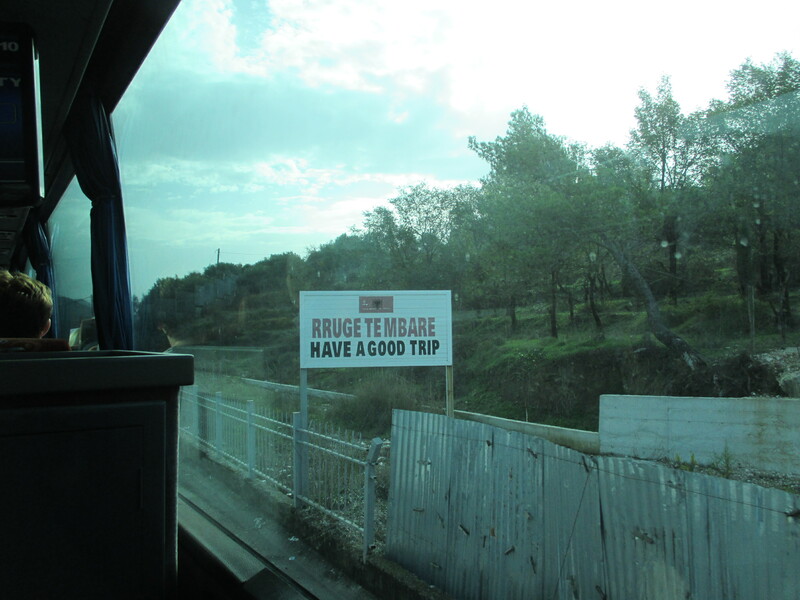 The border crossing took a while but was ultimately fine. We had to get off that bus in the town of Ioninna, where we needed to find another bus to the town of Kalabaka (the closest town to Meteora). We went in the station in Ioninna not knowing what to expect (but excited that there was such a thing as a station!) and discovered that the next bus passing through Kalabaka was leaving in just 10 minutes! We bought our ticket and hopped on that bus. When visiting Meteora, you have the choice of staying in the main town of Kalabaka or in the smaller village of Kastraki. We eventually chose Kalabaka because that was where the bus would drop us off. There are no hostels in Kalabaka, so instead we found a hotel on booking.com for not too bad of a rate. 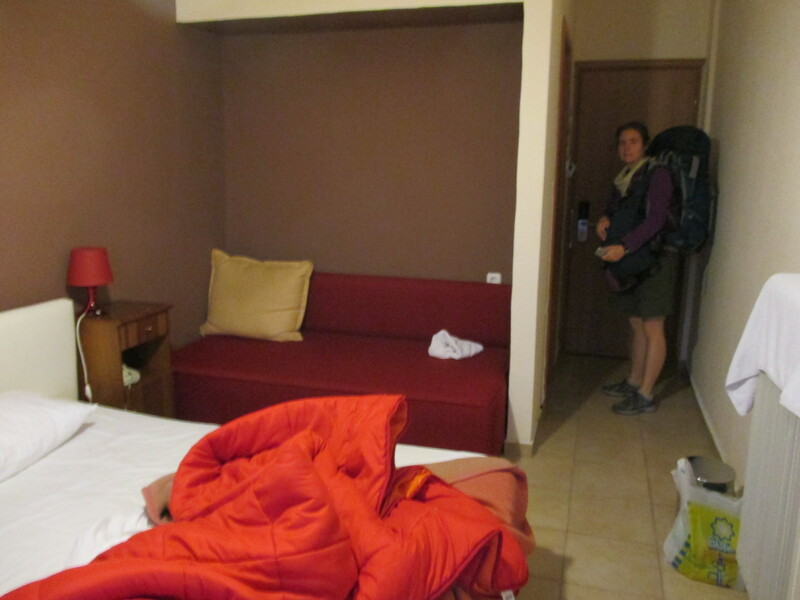 We stayed at the Hotel King on the main business road. The room wasn’t large, but we were pretty excited to have a big bed and our very own bathroom. 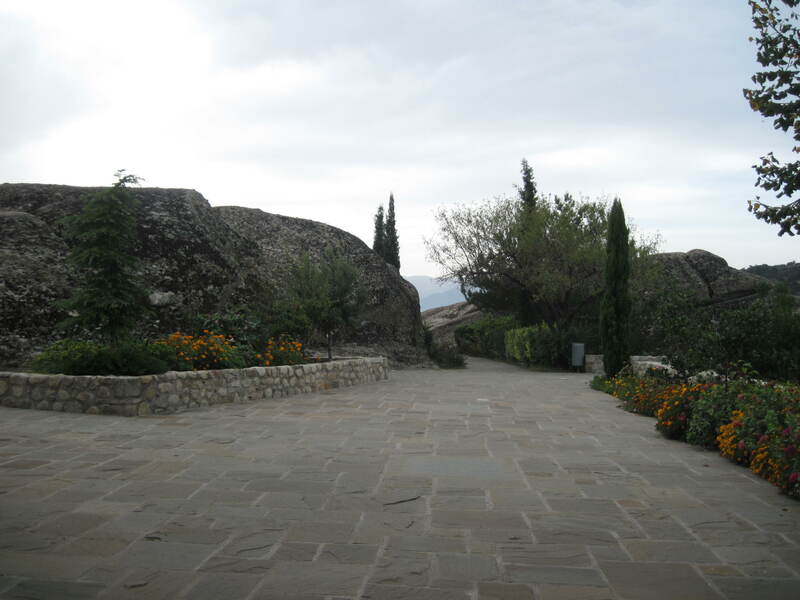 The hotel manager gave us lots of very useful information about visiting Meteora as well. 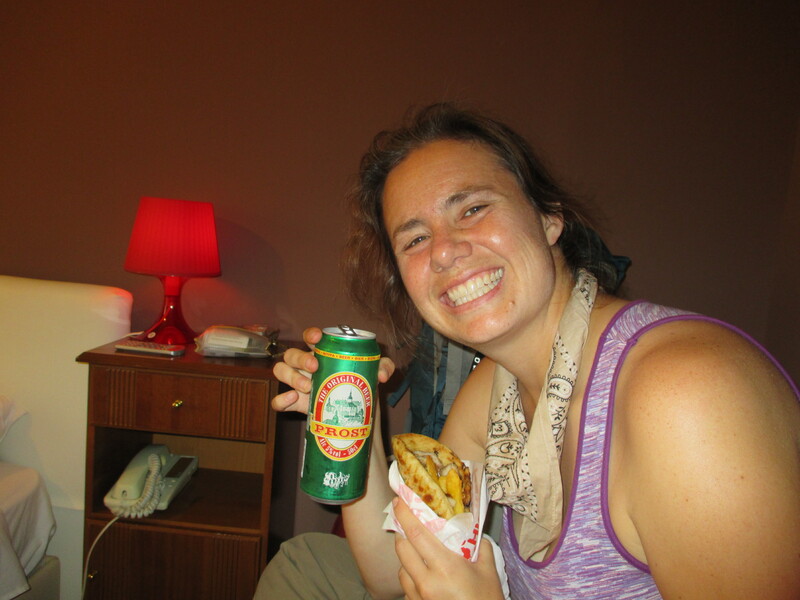 Hiked to The Monastery of the Holy Trinity – We had assumed that our first evening in Meteora would just involve relaxing after the long bus journey. However, the hotel manager informed us that one of the monasteries, Holy Trinity, would be closed the next day, so he recommended that we try to visit it right then. You can drive up to the monastery, but we didn’t want to pay for a taxi. Instead, the hotel manager showed us a nice hiking trail that would take us straight to Holy Trinity. As we hiked out of the town of Kalabaka and headed up, we really enjoyed the views looking up at the pillars. The trail was quite steep though, and then to get to the monastery itself you have to hike up more stairs carved into the pillar it sits on top of. So were pretty out of breath by the time we made it to the top! The interior of the monastery was pretty with a couple of different chapels, but there were no interpretive signs so we weren’t quite sure what we were looking at. Outside, there was a great view looking back down over Kalabaka and out towards the other monasteries. Walked Around Meteora – The next day we wanted to see some of the remaining monasteries as well. We decided not to see all of them, mainly because the admission fee is actually quite steep – 3 euros (4 US dollars) per person per monastery. We didn’t feel like doing the steep hike up again, so this time we decided to get driven up. The public bus company actually offers a bus three times a day that drives from Kalabaka up to Meteora. We were amazed to discover that we were the only people doing this! It was much cheaper than a cab and quite convenient. We got off the bus at the farthest east end of the circuit. The monastery there was overrun with tourists (just dodging tour buses in the parking lot was a challenge) and didn’t sound like it had anything inside of particular interest either, so we skipped it. We walked along the mostly level road back in the direction of the other monasteries. We were a little frustrated by the weather – it was cloudy and grey. It did not make for very impressive pictures, however, it did keep us from getting too hot and sweaty, which is a benefit, we suppose. We did stop at the Rousseau Monastery in the center of the circuit. We only saw nuns here so we think it may technically be a nunnery. Again there were some interesting works of art, but with limited interpretation, so we didn’t linger for very long. There were some other overlook points in this general area that did provide for a good place to take pictures in either directions. We made our way to the western end of the circuit and visited the biggest of them all – The Great Meteoron Monastery. This one turned out to have three different levels that could be visited. Not only did it have the biggest chapel we had seen so far, but it also had a few different small museums that showed some items from both Greek and Orthodox history. We’d recommend for future visitors to start here (or only go here if you only want to pay one admission), because it definitely does the best job providing a context for what you are looking at. To visit any of the monasteries, women must wear skirts (not even long pants are OK). Thankfully, they provide skirts to borrow by the entrance. Women also need to cover their shoulders. To get back down to Kalabaka, we found a trail that left from just below the Great Meteoron. It was steep, but not as exhausting since we were going down this time! Walked Around Kastraki – We had originally planned to spend three nights in Meteora since we figured we would need two full days to really see everything. However, since we had already seen everything up with the monasteries that we wanted to see, we didn’t have much we felt like we needed to do on our final day. We ended up just walking over near Kastraki (the small village nearby). We wanted to explore some of the old hermitages, which were wooden structures built in some of the caves in the pillars which were used by religious hermits. Unfortunately, the road to get closer to these was gated off, so we only admired them from a distance. We did find a nice shaded gazebo nearby where we could relax and admire the views, both of the monasteries and of a group of goats that were nimbly climbing over one of the pillars. Met Up With Travel Friends – We were able to meet up again with the couple that we connected with back in Berat. Our schedules synchronized so that we were both in the area, so we were able to spend another lovely evening hanging out with them. 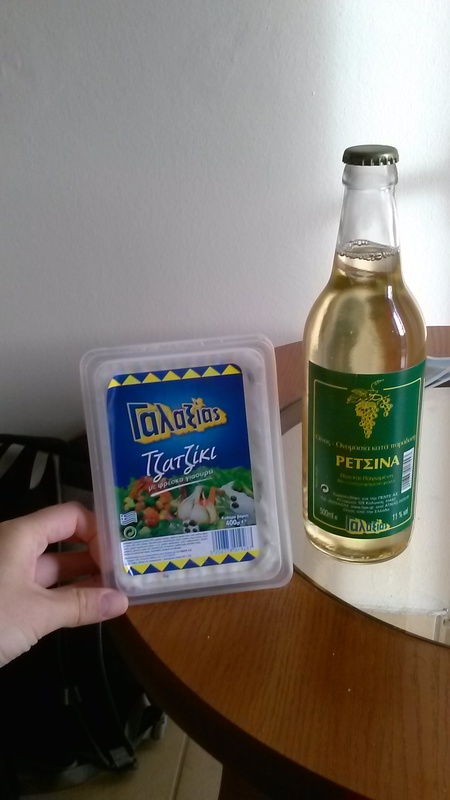 After being able to eat out for very cheap in Albania, our first stop in Greece was naturally a bit of a letdown. Compared to American prices, it actually isn’t that expensive, but it still carried a bit of sticker shock for us. So, on two of the three nights we actually just ended up getting something cheap to go, like a gyros pita or some tzatziki from the grocery store. The natural setting of Meteora is very beautiful, and seeing the monasteries on top of the pillars is definitely awe-inspiring. Visiting the monasteries themselves was actually a little bit of a letdown, with the steep admission fee, lack of interpretation and lots of crowds. We’d definitely recommend going, but don’t feel bad about just limiting yourself to the Great Meteoron unless you really are into Greek Othodox art. several things: Della you have started wearing a scarf around your neck a lot, how come? 2. That was quite the fashion statement at the last monastary. I gather it would have been alright to show your legs (drop trou). 3. tsatsiki by itself for dinner?????? I like that scarf because I can use it to wipe off any sweat I have of my face! I’m not exactly sure what you mean about the fashion statement. Girls must wear long skirts. I don’t think I needed the pants though if that was what you meant. I was confused because at first I thought it was a leg issue. I brought the bottoms to my zip offs, but it had to be a skirt. Weird. Loll, we did have bread with the tsatsiki! Hi Guys, just wanted to let you know that we’ve found your blog very useful for this leg of our own trip! As you well know its pretty hard to find info around this part of the world, so we’re appreciating your detailed posts!